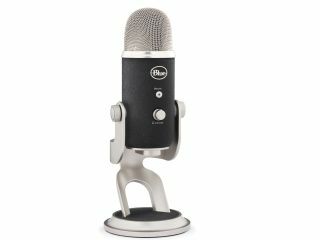 A Blue Microphones Yeti Pro could be yours! Attention all podcasters, vloggers and wannabe YouTube stars! No more must your work be sullied by the sub-par microphones built in to your PC or phone. TechRadar has teamed up with Blue Microphones, whose tagline is Sound Perfected, to grant four lucky winners some top notch USB-microphone technology. First prize is the just-announced Yeti Pro, the world's first USB microphone combining the highest digital resolution on the market with analogue XLR output. It features Blue's premium condenser capsules in a triple capsule array that you won't find anywhere else, as well as featuring a futuristic analogue to digital converter chip with a huge range in recording resolutions, from 22kHz to 192kHz. Three runners-up will also win a Blue Microphones Yeti, a five-star retro looking plug-and-play microphone. With THX certification you can rest assured it will record sound brilliantly – we can't vouch for your performances though. It also comes with a bespoke desk stand for ultimate comfort recording. So if you're looking to improve the quality of your sound recording with some good looking tech, come on down. This competition is now closed. The winners are Mr C Hui, Mr P Jones, Ms H Ball and Miss C Moulton.